At $79 the 2011 Kindle is at a price point that makes it almost irresistible to consider, and the price alone is driving consumers to find out where to buy the Kindle eReader. This being the fourth generation of Amazon’s bestselling eReader brings a few enhancements to the table and while it is the entry level device, it should offer enough for those looking for a dedicated eRaeder. The 2011 Kindle brings a couple essential features to the table, but with a price point of a dollar shy of the eighty marks, we warn you that this is a bare bones unit. That being said, to start off things off, we have a 6-inch E Ink display with waveform and font technology. Said technology sports 600 x 800 pixels with 167ppi and a 16 level grayscale. Other than the lack of multi touch, this is the same screen on the new Kindle Touch. Dimensions are 6.5” x 4.5” x 0.34” with a weight of 5.98 ounces. Moving along, we have 2GB of internal storage. According to Amazon, about 1.28 GB is available for usage which translates to about 1,400 books. If that is not enough storage there is the Amazon Cloud which will hold all your content that was purchased from the Amazon Store. With Wi-Fi supported, Amazon is breaking the Kindle free of the clutches of the PC. Unlike previous devices, the 2011 Kindle will not require a computer to sync as long as a working Wi-Fi connection is present. Supported media formats include Kindle (AZW), TXT, PDF, unprotected MOBI, PRC, HTML, DOC, DOCX, JPEG, GIF, PNG and BMP. Unfortunately, those looking to listen to tunes on this Kindle will be left out as there is no support for audio files. Amazon’s Kindle Touch does offer that capability for an additional $20 though the entry level model will carry advertisements. The ads are not too cumbersome in our humble opinion, and can be a real money saving perk once you decide where to purchase Kindle eReader or the Kindle Touch. Amazon hasn’t done a radical redesign of this the fourth generation Kindle. We are not saying this is a bad thing because after all this is an eReader and it’s more about what it can do than how it looks. First of all, the screen is improved over the third generation model. While we still have grayscale screens, the refresh rates have been improved and other than that, we have a better font for reading text. 3G is not included in this model, so you will be forced to use Wi-Fi whenever and wherever you need to download content, unless of course you sync via the computer which is perfectly fine but causes more hassle. Amazon claims that the Kindle can get a full month months charge with Wi-Fi off and an hour of reading a day. We didn’t follow their exact directions, but with about two hours of reading per day with Wi-Fi off, we managed to get into week three without having to charge the Kindle. Those might not be the ideal marks, but they are certainly better than what you could find on any tablet. The 2011 Kindle is equipped with a web browser. If you need to check up on news and the likes, it’s great for that, but don’t think about viewing multimedia with this thing. Speaking of multimedia, this brings us to the big issue of navigation. Navigating the device is done by a four way directional pad with buttons for back, keyboard, menu and home. If you plan to do any amount of casual web browsing, you will find this configuration frustrating. As for the book selection, Kindle is sporting a little fewer than 1 million books on its store. This is less than what B&N is carrying for the which comes in at 2.5 million. Unlike the Nook Touch at Barnes and Noble however, the Kindle comes with free online storage which should sweeten the deal for many individuals especially if you have more than 1400 books on your device. Overall, the 2011 Kindle excels at offering the basics an individual is looking for in an eReader. It won’t give you the bells and whistles as its pricier siblings, but for an eReader that is dedicated to reading and reading only, this is exceptional. In the end, we admire what the 2011 Kindle has accomplished, a solid eReader and little else. If that is what you’re looking for, this is the eReader for you with its high quality, smooth performance and lightweight, portable design. 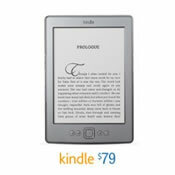 It is a more than worth while consideration to purchase the Kindle eReader.